Amongst other things, Frank Swettenham wrote " His ( the Malay) main characteristic is an objection to continuous hard work ; the climate and the soil encourage him in the belief that life can be supported with little effort, and he accepts the facts". ( Peoples of all Nations - Volume II : British Empire to Dahomey, edited by J.A. Hammerton, circa 1930 ). It's wonderful to be back home in KL despite the haze, the heat and the water rationing. It's sunny and breezy, no chilblains, no cold bed and loads of betik and buah semangka. But the brain has been quite reluctant to get going and so I resorted to my usual escapade - rustling my cache of old books. I thought it would be good fun to display some of these illustrations from the 1930s about my ancestors' "objection to work". 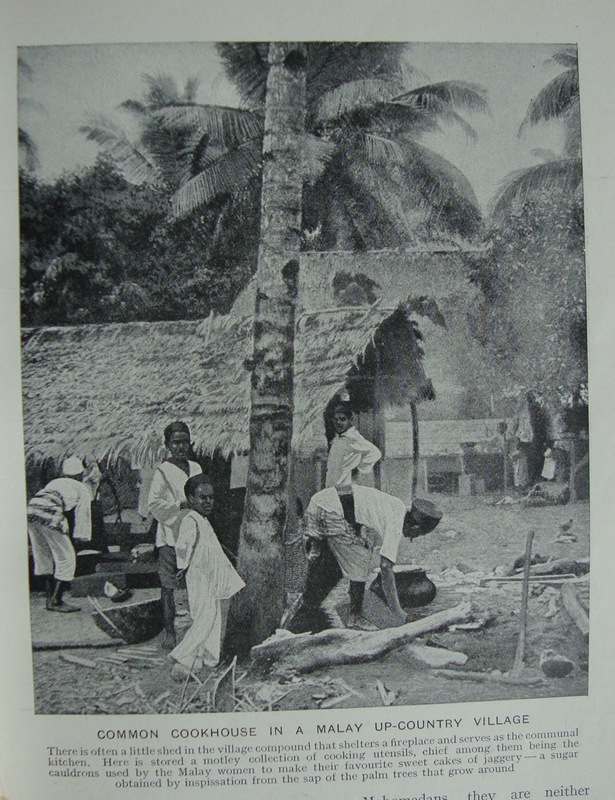 "Malay girl workers on a rubber estate in Singapore"
" Beauty and Utility in Perfection : Champion Coconut Trees"
"Labour in a Lovely Setting : A Betel Nut Palm Plantation". These two palm trees bring me to this poem about the Coconut tree and the Betel/Areca Nut tree from the "MPH Malayan Primer", 1932. Although that poem was written for children, its message would do well for adults as well, for politicians, academics, the clergy and all purveyors of human rights. For certain that will prevent hypocrisy and self-righteousness. 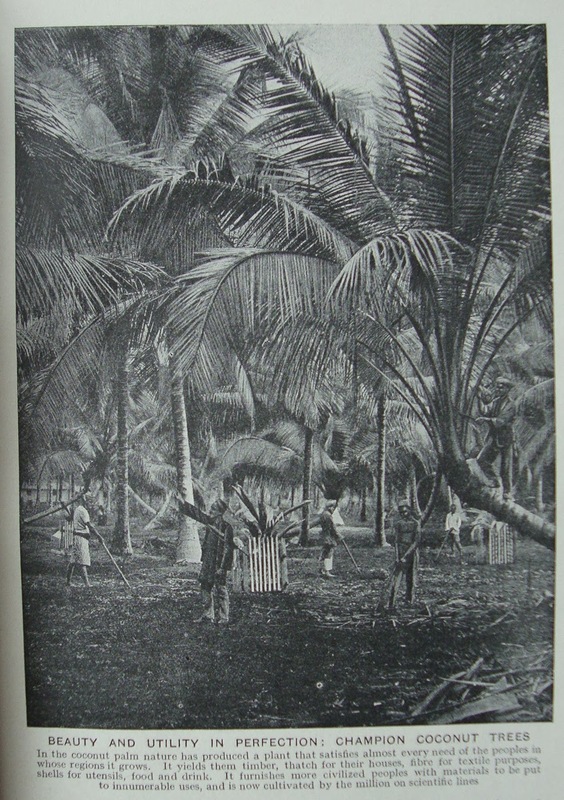 "Preparing Rattans under over-arching palms, nature's kindly gifts to man in tropic regions. Bundles of canes are distributed among the factory hands, who pull them round posts to crack and peel off the outer skin to render them more supple, even rubbing them with sand with the same object. The canes are then ready for splitting into halves, quarters, and so on according to the use to which they are to be put..... "
My ancestors also got to work on cooking this - a sweet delight for all Malaysians and Singaporeans. "Common Cookhouse in a Malay Up-Country Village ....... the cauldrons used by Malay women to make..... jaggery, - a sugar obtained ....... from the sap of the palm trees that grow around". In India it's called jaggery while the Malays name it as gula melaka or gula kabong. It has a better flavour than processed white sugar and it's healthier too. Wow, my ancestors were quite clever eh? Malays were not involved in the "heavy duty" and highly remunerative economic activities like rubber plantations and tin mines and of course commerce. But they did participate in other occupations - the ones that were not as profitable. "Malays Converting Poisonous Roots Into Nutritious Food. In the factory the manioc roots are peeled and passed through a cylindrical machine in order to extract by pressure the bitter , highly poisonous juice. The roots are reduced to powder which is placed in vats and mixed with water. A plentiful supply of water is an important requisite in the preparation of tapioca, for much depends upon its being thoroughly clean." Note the white Tuan supervising the natives. For the benefit of modern Malays who are more familiar with French fries and pizza and bread rolls, tapioca flour is used for cakes and cookies, as a thickening agent for food products and as a binder for pharmaceutical tablets. It is also gluten-free. For our ancestors and for some of us today, manioc or tapioca or ubi kayu gives us local delicacies like tapai and krepek. For me, nothing beats boiled ubi kayu with sambal blacan or gula melaka syrup for a mid-morning or mid-afternoon snack!! Here's a little example of Malays putting their toes into a bit of commerce.
" Fresh Nuts for Sale in Kajang". If all the above indicate indolence, then commentators like Swettenham are as good as the monkey's uncle! But this one image takes the cake. Rice farming - the Malays' traditional occupation till today : which is also the most exhausting and backbreaking livelihood - was described as an indication of Malay sluggishness. "Lazy Malays Take Much Pains in Tilling The Soil". And this is said in the last sentence, "..... for they heartily dislike toil and their indolent, pleasure-loving nature would always borrow rather than earn money." That's rich! Isn't the global economy today creaking and collapsing because of the credit crunch and the banking crisis - too much borrowing, not enough conservation and savings, and too much greed? Why toil when you can make loadsofmoney by speculating and gambling with other people's money? Better still, unlike those 'indolent Malays', today's "more industrious and more civilized people" can expect the government and the taxpayers to bail them out. This is my favourite picture of my ancestors. "Rich Cargoes of Tropical Fruits On Their Way To The Malay Market." "The more insignificant of the trading craft are employed for this purpose, and on market days a perfect fleet of small vessels may be seen plying up the river bound for some convenient centre where they may discharge their ripe cargoes. The craft used are chiefly dugouts, or light fishing boats - things so small and crazy that only an amphibious creature like the Malay would trust himself in them." If our ancestors - like one of those entrepreneurs in the above picture - should turn up today and look at the condition of their descendants, they would probably shake their heads in despair. They will see so much gain and achievement, but the semangat Melayu has been ground into the dust. An amphibious creature can survive on both water and land - that is why we call our homeland Tanah Air. A people who originate from such disparate environment should be able to straddle (with humility and dignity) the modern and traditional, the spiritual and material without shooting themselves in the foot and stabbing each other in the back. A lovely song from another true blue anak Malaysia. Nor...mus here. Dont know if you know this blog. good reaading.